OBJECTIVE: To facilitate innovative, experiential arts-based programs in schools and community organizations. Design innovative arts-based curriculum for comics creation and self-publishing workshops. 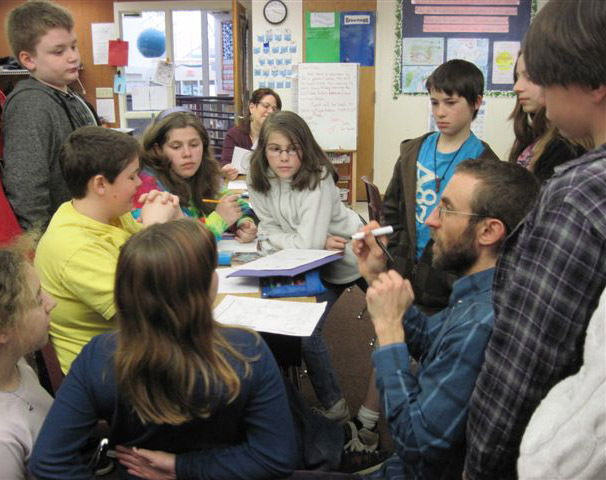 Develop and lead school residencies and other programs for students of all ages. Plan and coordinate professional development programs for teachers. Write grants to support international cultural exchanges between multiple community organizations. Create programs for clients including Keene State College, Monadnock Humane Society, New Hampshire National Guard, Norman Rockwell Museum, New Hampshire State Council on the Arts, Kimball-Jenkins Estate, Currier Art Center, Sharon Arts Center, Deerfield Academy, Harvard University, Weeks Act Centennial Committee, and more. Teach basic core academics full-time in multi-age independent school classrooms. Plan, prepare, and direct special school-wide events (such as the annual Living History Festival). Develop project-rich and discovery-based multiple intelligences curriculum to address wide range of learning styles and needs. Teach specific curricular subjects (science, music, Spanish) in multiple classrooms to grades Pre-K-7. Develop music curriculum (coordinated with school-wide history curriculum), including regional folksong, folkdance, and instrumental instruction. Develop innovative technology solutions to facilitate communications with families, public relations, and marketing operations. Guide students in designing international learning, exchange, and fundraising initiatives (Example: Peruvian earthquake relief roadside clean-up project). Website design and management, graphic design.